MARAWI CITY, Philippines – Nearly two years of never-ending struggle to go back to where their houses once stood, the women and the youth held another show of anger and dismay over the failure of the government to improve the ground zero here, the scene of the heaviest battles of the armed forces and Maute group in 2017. On Wednesday, hundreds of women and youth marched around the streets of the Islamic City and toward provincial gym to air grievances, anger, and dismay over long overdue promises of the Marawi rehabilitation in 24 barangays of ground zero also known as the ‘Most Affected Area’ (MAA). They barged through the public hearing conducted by the House of Representatives sub-committee on Marawi rehabilitation and the Committee on Disaster Management and to ask.the Task Force Bangon Marawi chairman Eduardo del Rosario and other department heads over their action on supposedly rehabilitating the city. During the public hearing, Eduardo del Rosario, who is also the head of the Housing and Urban Development Coordinating Council, said that once the debris clearing is done by August 30 this year, residents could finally go back to their areas to rebuild their homes. He said those who were least affected could return to their homes in the first week of July to repair their structures if these were still safe to use and if they could obtain permits from the City Hall. The residents fled the city during the May-October fighting in 2017 but the residents were barred from returning due to unexploded crude bombs and ordinances. Del Rosario said there were 49 unexploded bombs found already in the former battleground that he “can hamper the safety of the residents” if they allow them without clearing the area. He said there was also inconsistency in the land titles shown by residents. “We found out that some houses and infrastructure are built along Lake Lanao contradicting to what is stated in the land title. With the unclear coordinates of land title, it will be a big future problem” Del Rosario said. But residents pressed on the promise before of Del Rosario about the construction and rehabilitation that he said would be completed by December 2021. They said this was the same timeline for completion he stated last October 2018 even if no construction works have started in the MAA. Before the public hearing, Drieza Lininding of the Moro Consensus Group told Davao Today that there were only limited IDP audience to attend the dialogue. Lininding said the people did not know about the public hearing “and were told that only three-person representatives in the 24 barangays were invited” to attend the event on the morning of March 20. 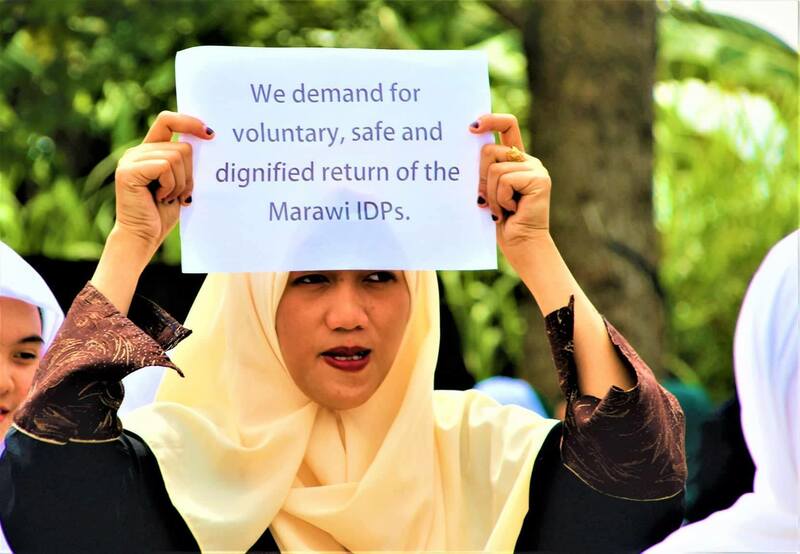 This prompted civil society groups and residents to rally and march the streets of Marawi going to the provincial gym to air grievances as well as clarifications on their recent situation. “This public hearing was not announced to the public. We initiated to announced it through social media because we don’t have local media here. Probably they will not invite us because we seem to be an anti-government plan in Marawi” said Lininding. Despite the attendance of residents during the public hearing after they were allowed to enter the gym, Lininding said: “it was too late to conduct the hearing after less than two years has passed”. “ It should be conducted long ago as the over site power of the Congress can be used to monitor non-performing agencies to pressure them. What is sad is that up to now we are still talking about the relief assistance, transitory shelters, and profiling. Meaning we still debating on the immediate assistance yet supposed to be we are now in the middle of the rehabilitation,” Lininding told media. In the recent presentation of the Marawi City Master Development Plan, the projected infrastructure projects cost of P12,893,255,380.13 with a target timeline from 2018 to 2021. These projects include Sewage treatment plant, Port Facilities and Wharves which includes Cold Storage Facility, Grand Padian Market with an ice plant, hospital with basic equipment, barangay complex with health center and Madrasah school building, school building, Agus River and Lake Lanao Promenade, Maritime Headquarters, Halal Slaughter House, Multi-Level carpark, police station, fire station, correctional facility, convention center, peace memorial park, preservation of historic site, Multimodal transport hub, school of living tradition and Marawi Museum. Hafsah Bint Amer Hassan, a resident of ground zero and was present during the public hearing said they have been “enduring the damages and false promises” of the government over the years. “The Task Force Bangon Marawi is not doing their job very well. In fact what we see as a problem is that they did not involve the residents in the planned rehabilitation even if from the start we are vocal that we can rebuild Marawi according to our own terms and preferences” Hassan said. Hassan pointed out that the planned infrastructure project in the ground zero “could only be beneficial to the few who have interests in the city” but not to its residents saying they should be asked first whether Meranaws are in favor or not with the proposed projects. “We cannot agree that outsiders are one’s deciding on what to do and where to put. Again and again, they are not listening to us. Their argumentation is not based on what we want,” Hassan added. When Lininding was asked if the proposed project would result in development in Marawi, he told Davao Today that they doubted the government plan. “I don’t see development only because we were given infrastructure as long as the people remain poor and have limited access in its own community”. MAA has only an area covering 250 hectares straddling 24 villages that Lininding said, “no space for more structures unless people will be displaced” to cater the road widening and other projects. During the public hearing, Sultan Hamidullah Atar of Marawi City has been vocal that “the task force has been 100 percent inconsistent” in their performance in the rehabilitation. In an interview with Davao Today, Sultan Atar emphasized that the Task Force Bangon Marawi ( TFBM) in its existence did not deliver what was expected them to do. Despite the presentation during the public hearing, the Sultan of Marawi pointed out some discrepancies mainly the unallowable demolition of houses without consent which was made November last year under a construction company FINMAT which was also suspended last December by the National Housing Authority (NHA). The Sultan of Marawi also added, ”the major collateral damage of the TFBM’s weaknesses is the people who were still suffering every day”. Lininding for his part also questioned the consistency of the Task Force in presenting to the public their right to know “regarding the process on the Marawi rehabilitation”. “The data is the one of the issue and problem that delayed the whole process considering that each agency has there own data that is not compatible to others that they don’t want to recognize it,” said Lininding. As the rehabilitation in Marawi has remained and painstaking struggle among residents, Sultan Atar has called the residents of Marawi to be more vigilant and active in participation to call for government prompt action. The Sultan of Marawi also urges the young generation of Meranaw to take the lead of struggle as he said, “they will be the future of the Islamic City”.